NeuVector, which delivers continuous network security for containers, today announced the immediate availability of NeuVector 1.3, the most significant release of the container firewall security solution since its initial launch. Adapting to evolving container security needs, NeuVector 1.3 features a wealth of key security, integration, and UI additions. NeuVector is also releasing a new Enterprise version of the solution, which features capabilities specifically designed for large-scale deployments. NeuVector is the only true Layer 7 container firewall, providing Layer 7 filtering for all container traffic, along with network intelligence that understands application intent and disallows suspicious behavior. NeuVector 1.3 enhances these critical protections across several fronts, including the ability to detect attacks that rely on tunneling (a technique used to conceal attacks). The new release also adds automatic forensic capture on every detected threat, and makes it simple for security teams to safeguard connections to and from external and legacy networks. The NeuVector solution is compatible with Docker encrypted networks (enabling inspection of encrypted connections), and is also integrated with Red Hat OpenShift, Rancher, and Kubernetes. The NeuVector 1.3 solution – a container itself – further leverages its strategic position within Docker cluster deployments to add a series of new general host and container security features. 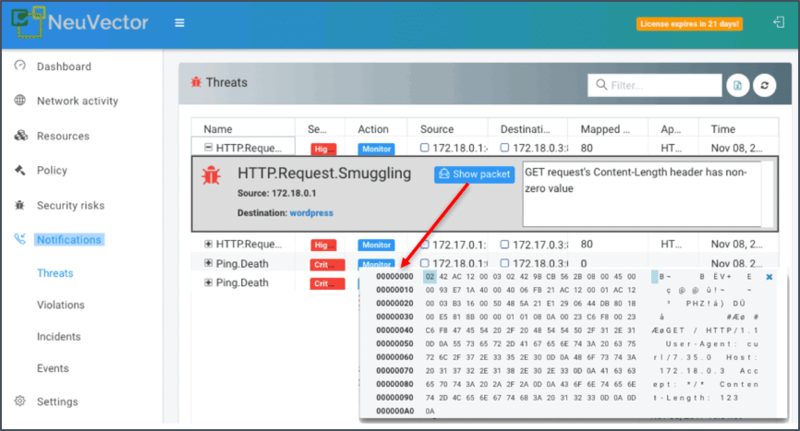 The solution now detects suspicious process and privilege escalations within hosts or containers, thwarting breakout attempts as attacks seek to spread malware or probe other vital resources. NeuVector 1.3 also detects reverse shell connections, which attackers use to connect a compromised host or container to a command and control server in order to run commands remotely. These capabilities join NeuVector’s existing auditing and compliance features – such as vulnerability scanning and CIS benchmark security testing – in delivering effective security against known threats. Additionally, to make large-scale adoption easier for customers, an Enterprise version of the solution is now available. In addition to offering the security capabilities included in NeuVector 1.3, the enterprise-specific product features include polices based on DNS names, webhook notifications for critical security events, REST API integration for automation into CI/CD pipelines, rolling updates to maintain protection during NeuVector updates, and priority technical support. Access control support for single sign-on (SSO), SAML, and LDAP integration is also added. NeuVector NeuVector was founded by security and enterprise software veterans with the vision of simple, scalable security for container based applications. The team has over 20 years of security, virtualization, and enterprise software experience from companies such as VMWare, Fortinet, Cisco, and Trend Micro.